Besides the obvious Palanga attractions such as the beach and Basanavicius Street, it is also a pleasure to take a stroll along the pretty old parts of Palanga with cute wooden villas, a few museums, sculptures and cafes. The famous Palanga Amber Museum is worth visiting for its impressive amber collection and also to walk around its romantic premises, the former 19th c. mansion of Count Feliksas Tiskevicius . The museum displays more than 20,000 pieces of amber, among the finest pieces and John’s favourite are inclusions of insects and flora, trapped inside during prehistoric times. You will also see a 15-16th c. amber cross, amber rosaries, decorative boxes and many more. One of the largest amber pieces in Europe, the Amber Sun or SunStone is on display as well. If you are in the mood for a peaceful stroll surrounded by idyllic scenery, visit the pretty Botanical Garden. It is a large landscaped park, outfitted with ponds, trees brought from different European botanical gardens, lawns, rosebushes, sculptures and fountains. It also contains the Palanga Amber Museum. Close to the Amber Museum you will find Birutes Hill, which is a relict dune and the highest point in Palanga. In the past on this hill there used to be a site of a pagan shrine sanctuary and observatory. Nowadays it’s worth climbing to the top of the hill for a romantic view of the sea and a charming stained glass window chapel. If you want a change from the bright sun, the beach and noises of the town come and stay for a while in the Neo gothic Church of Saint Mary to enjoy peace and its beautiful interior. 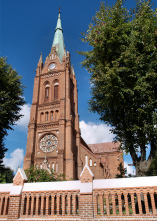 The church is the highest building in town and its steeple can be seen from different view points around town. It’s easy to find as it stands on the central Vytauto Street. Heading South Vytauto Street you will come across a cute square with a number of interesting sculptures made by Lithuanian artists.